This afternoon, at the University of Barcelona (Faculty of Medicine), the face to face component of the EUDONORGAN training program was officially opened. 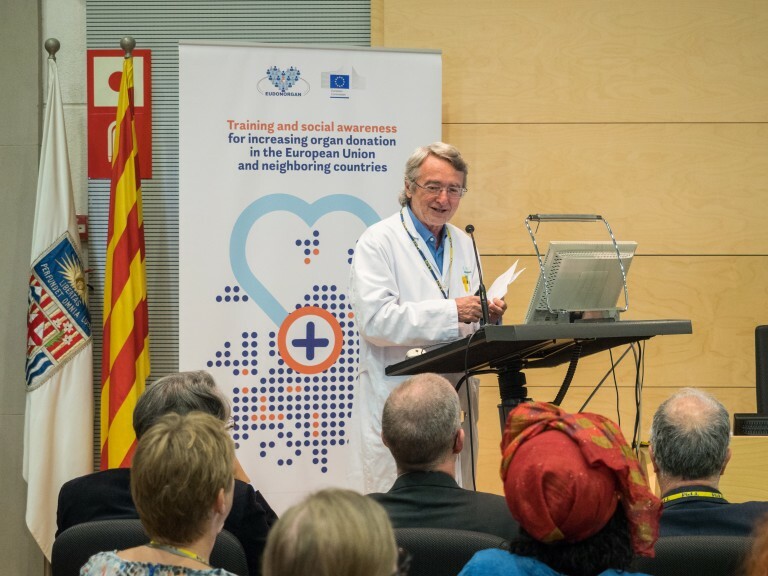 During the welcome session, representatives from the World Health Organization, the European Commission, the Council of Europe, the Spanish National Transplant Organization, the Catalan Transplant Organization, the Irish Kidney Association & World Transplant Games along with officials from the University of Barcelona and the Scientific Parc of Barcelona expressed their support for the project This training program is one of the main activities of the EUDONORGAN service contract, funded by the EU budget on the initiative of the European Parliament. It was awarded by the European Commission and developed by an international consortium, including universities and organizations located in Spain, Slovenia, Croatia and Italy. EUDONORGAN mainly aims at enhancing the positive attitude towards organ and tissue donation, and ultimately improving donation rates in the European Union and neighbouring countries. The training program consists of a blended formula, which includes online (through a web App) and face to face sessions; the face to face course takes place in Barcelona (Spain) on September 18-22, while the online modules have already been concluded. An important added value of the EUDONORGAN training program is represented by its target groups, composed by health care professionals involved in organ donation and transplantation activities and non-health care professionals, such as journalists, communication specialists and patient group representatives. In the face to face course, the two different target groups are brought together for best practice exchange, dialogue and networking. The EUDONORGAN training program has been attended by 101 participants, from 28 different countries (Austria, Belgium, Bosnia and Herzegovina, Bulgaria, Croatia, Cyprus, Estonia, Finland, France, Germany, Greece, Hungary, Ireland, Italy, Latvia, Lithuania, Malta, Montenegro, Netherlands, Poland, Portugal, Romania, Serbia, Slovakia, Slovenia, Spain, Sweden, Turkey). “One of EUDONORGAN great innovations is that it will bring together transplant and non-transplant professionals alike to share their experiences on key topics such as deceased and living donation, approaching family members and communication aspects linked to organ donation”. “When looking at organ donation for transplantation the concept of the Circle of Life fits well. A death in an ICU does not have to be the end of a story, it offers the potential for new chapters to be written and with these new chapters there is comfort for those who have lost their loved one. We must remember that organ donation is not only about the recipients – saying yes to organ donation is a positive legacy we can all potentially leave to our families”.